Cross body bags have been my go-to ALL summer long. I love using big tote bags (the bigger the better!) but cross bodies and clutches alike are perfect for dressed up outfits and also for events that go on not only during the summer but all year round. For every concert, etc I've gone to lately, I've been taking a cross body with me and it's been so helpful in not really having anything to carry or worry about! I went to an all day music festival in June and I was taking a cross body with me and I was so nervous I was forgetting something. I'm the type of person who has everything that I could ever need with me at all times, so taking a small bag for an all day event was pretty difficult! That's when I realized I really only needed certain necessities. Now, whenever I'm using a cross body I go to my list of cross body essentials! How cute is this Kate Spade cross body?! I found this at the outlet in June and I bought in three colors because it's such a perfect size! Hair ties: there's never a time that I don't 1. need a hair tie and 2. have a hair tie! No matter how many I buy, I always am loosing them or they snap super easily (with my thick, curly hair I'm not surprised!) I take at least three with me where ever I go and the no-show elastics that come in SO many colors are super fun! My black and white striped one is my favorite and it's perfect for when you don't want a crease in your hair when you take it back down. These have been a must have for me and I pick up a new pack whenever and where ever I see them. I also always have a couple of bobby pins with me because they're good for so much more than just keeping your hair in place! Lipstick/lip gloss: if there's any makeup that fades the most often, it's lipstick! I always carry around the color I'm wearing that day for easy re application. My favorite and most used lately is YSL #7. I usually carry around a makeup bag but that obviously wouldn't fit in a small cross body so I just take the essentials. Re-wetting eye drops: if you wear contacts like I do, you know how important these are! I recently switched to daily lenses (which I am loving and recommend 100% over the two weekers!) and my eyes get SO dry that I use these drops probably twice a day! The bottle is super tiny which makes it perfect and easy to carry around in a cross body - thank god! Roller ball perfume: most perfumes come in roller ball form or at least a smaller bottle. I always look for these when I buy a new perfume so that I can carry it around with me to re apply throughout the day. Card/ID case: another beauty of using a cross body is not having to carry around a 5 pound wallet with tons of change in the zipper compartment! Card cases come in so many different colors, brands and styles and they fit super easily in a cross body bag. I love my Kate Spade card case that I scored at the outlet a few weeks ago! They're easy to find and trust me you'll be glad you have one! Chapstick: my two favorite chapsticks are Burt's Bees and Vaseline's Lip Therapy. Both are so hydrating and again, so tiny and easy to carry around! Next to my phone, chapstick is one thing I can never leave the house without. If you're looking for every day essentials that will fit in a smaller bag, check out the travel sections in stores like Target and CVS. You can get small bottles of hairspray, mini deodorants - the list goes on and on and they fit perfectly in a cross body. A cross body may seem tiny, but you'd be amazed at how many things can fit in them! What are some of your essentials when you're using a smaller bag? Love that bag! These are all good things to have.. I never go anywhere without gum.. if my bag is too small to fit a whole pack I'll just take a few pieces! Thank you!! I do the same haha! I envy the simplicity of this bag. I try so hard to pare down to just the basics, but I always end up carrying a tote for books and notebooks (not for school... for always. I always bring a book with me). But that pink is fabulous! Isn't it gorgeous?! After all the discounts at the Kate Spade outlet it was like $50! Same here, I always take a tote to school! It's such a perfect size!! : ) I love it so much! Small bag but just big enough to carry the essentials. Like ur bag too. I'm also super obsessed with the crossbody style! And I'm totally with you on always needing chapstick and hair ties. I can't ever surivive without! It's so much easier than a big tote bag at times! I love that pink bag! I keep a small pill bottle in my crossbody, and just refill it when I need to. I have to take medications during the day, so I have to keep them with me. Since what I take are all different looking, I can mix the daily doses in one bottle. I also keep a debit card, a small notepad, and a pen in mine. That's super smart! I should be carrying a pen around, I never seem to have one! Such a cute bag, and great essentials to have in it. I NEVER have a hair tie either! They disappear with those missing socks in the place of no return ;) Great post! I'm convinced my socks and hair ties are in a special place together! ; ) haha thank you so much! I would use it every day if I could!! This bag is so cute! I always carry all this stuff in my little cross body bag as well. Love this bag! The color is amazing. I carry the same things in my bag! Thank you for joining our linkup today! Love this post girl - you nailed it!! I carry each and every one of those items in my cross body - especially when I head to the mall! It's such a beautiful color!!! Love, love, love your blog. I have bookmarked for reading this weekend! My bag always ends up weighing 2 tons!! Ugh! That is so sweet!! Thank you so much - made my day!!! : ) so does mine it is so bad!! 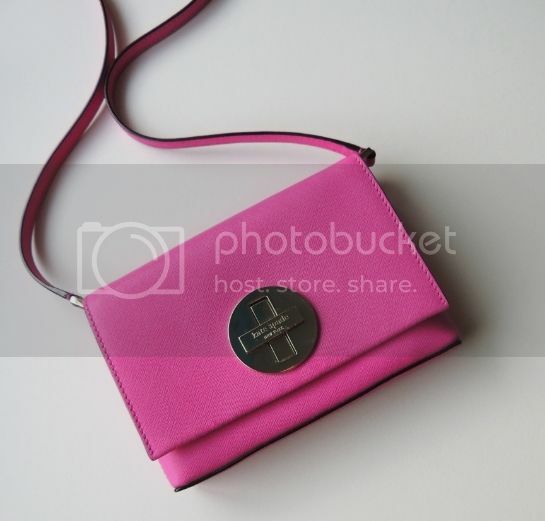 That is such a cute little cross body. I always seem to forget lipgloss and chapstick. It makes me upset every time. Haha! I always forgot it before I started making myself an essentials list! That is SUCH a cute bag! I am working on downsizing what I carry with me every day, and I would love to get to this point! Totally cute, I would love it if it's was like a purple or something lol. I super hate lugging around purses, clutches are more my thing and I dig this! That is a seriously cute bag! I'm with ya on the not wanting to lug around a big bag at times! Sometimes its so much easier this way!! I'm heading back to the outlets and hoping to find it or one similar in black haha! This is a great idea for a post! Sometimes I prefer the cross body as well rather than a huge bag - so much easier! Thank you!! : ) It's so much easier for certain events for sure!